I’ve been thinking about how light, especially candle light, is prominent for both Jews and Christians at this time of year. Perhaps you have held a little white candle while singing Christmas carols on Christmas Eve or when caroling at a nursing home or from door to door. In the Latino/a culture in which I served as a pastor for many years, there is a tradition called Las Posadas. The carolers go from door to door re-enacting the search of Joseph and Mary for lodging. At the final stop, refreshments are served, including a Mexican variety of hot chocolate (it’s an acquired taste). And every time I walked in the procession, I was almost unimaginably cold. For Christians who follow the Church Year, the last Lord’s Day of the Year is “Christ the King,” followed by four Sundays of Advent, Christmas Eve, Christmas Day, the Season of Christmas, and then Epiphany (remembering the Gentiles, and the Star that led them to the place to worship the Messiah). 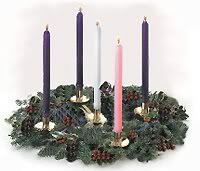 Each Lord’s Day in Advent a new candle is lit on the Advent Wreath. 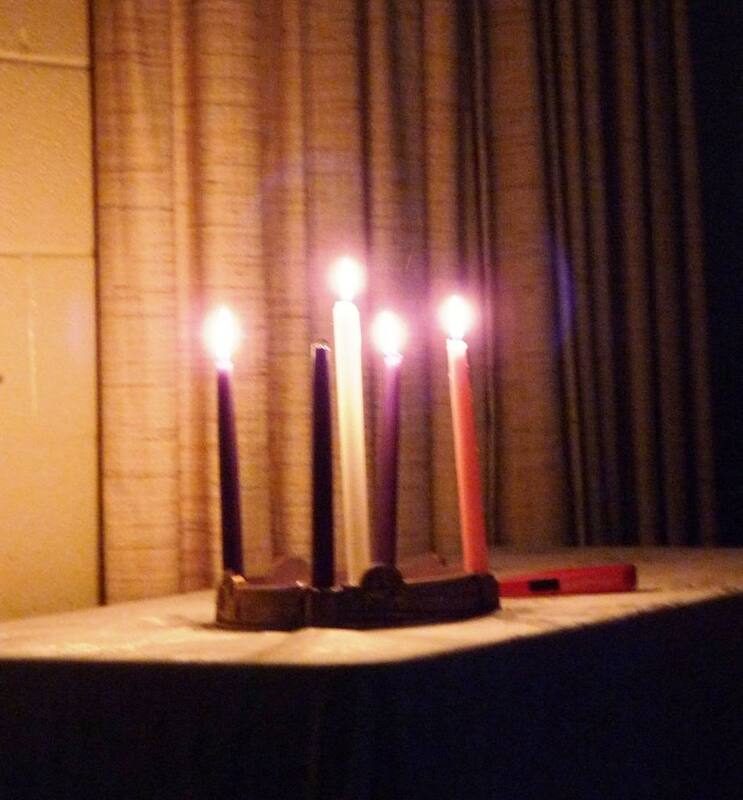 Last Sunday, November 29th, was the first Sunday of Advent and the Hope candle was lit. Each Sunday an additional candle is lit, along with all the previous candles. 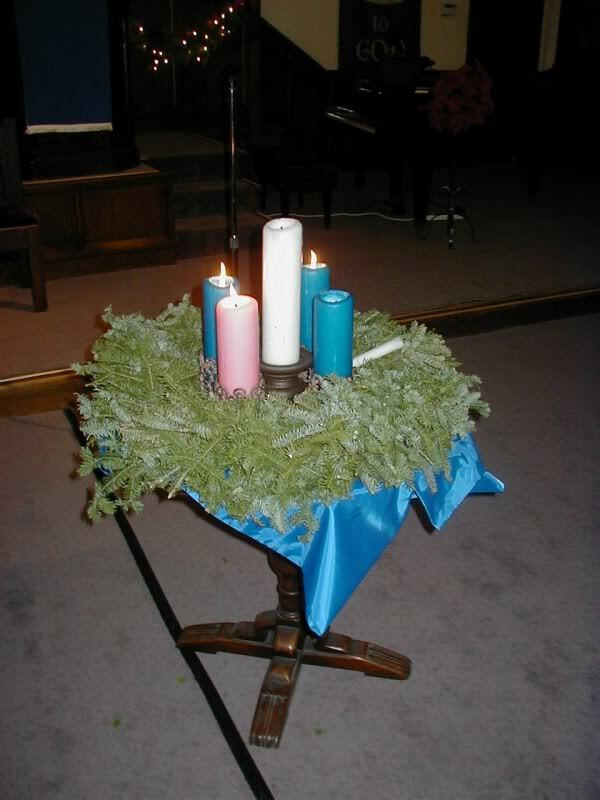 The white Christ candle is placed in the center of the wreath and is lit on Christmas Eve or Christmas Day. A family may also light the Advent candles at home. 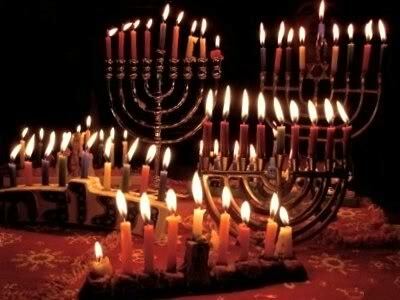 The Jewish observance of Hanukkah is also celebrated with candles, a festival of lights. The background of Hanukkah takes us back to the 2nd century, BCE, when Judah was under occupation and oppression by the Greeks. The Greek Emperor, Antioches Epiphanies IV, even desecrated the temple in Jerusalem. A family of priests (one son was called Maccabee) revolted in about 165 BCE, and sought to take back, and reconsecrate or rededicate the temple (the word, ‘hanukkah’, may be translated as ‘dedicate’ or ‘rededicate’). Under siege by the Greco-Syrian army, the priests found a small amount of oil (they thought a day’s worth) to light the temple. However, the oil lasted for eight nights! Thus Hanukkah is celebrated for eight nights and an additional candle of the Menorah is lit on each night: there are nine candles, one of them to light the other candles. The first biblical mention of a “Feast of Dedication,” is in John 10:22, when Yeshua stood in the Portico of Solomon of the temple. Hanukkah began on the evening of December 6th this year. Hanukkah remembers and celebrates the LORD’s provision for Israel and his faithfulness to his promises. It is also an opportunity to rededicate ourselves to the Missio Dei (Mission of God) in the world. But what I’m interested in now is the place of light in YHWH’s salvation of humankind. In the Bible, both the Tanakh and Brit Hadashah, ‘light’ is sometimes used literally, as that by which we see the material world, avoid obstacles, etc. It is also used metaphorically as knowledge, wisdom, the holiness of God (1 John), the glory of YHWH (shekinah), candor, openness, the witness of disciples (“city on a hill”) and divine guidance. The Living God exults in light, as a material reality, a spiritual reality and as a metaphor, from the Garden (Eden) to the City (New Jerusalem). From “Let there be light” (Gen. 1:4) to the pillar of fire that the LORD used so that Israel “…might travel by day and by night” (Ex. 13:21) to the Promised Land, from “I will make you as a light for the nations, that my salvation may reach to the end of the earth” (Isa. 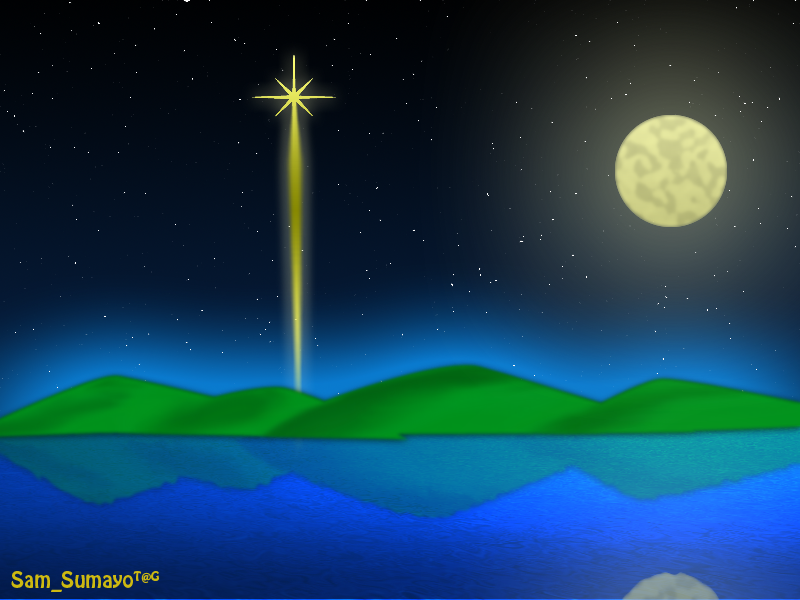 49:6) to the star that showed the wise men where the Christ child was, from “I am the light of the world” (John 8:12a) to “…the city has no need of sun or moon to shine on it, for the glory of God gives it light, and its lamp is the Lamb. By its light will the nations walk…” (Rev. 21:23-24a) and light crackles from God’s fingertips and lightens our darkness. Ladies and gentlemen, we have come to a turbulent patch of mixed metaphors, rapidly changing metaphors and changing definitions; stay seated, keep your hands inside, and do not attempt any sudden movements until we have finished. Let’s make several observations about light. 1) When you don’t have it, you wish you did. If you have gone back-packing or attended retreats, camps or conferences, you were instructed to bring a flashlight. We still keep flashlights and candles available for the occasional blackout here in Southern California. 2) Often light appears brighter against a dark background. The main reason we cannot see many stars is the ambient light from cities and towns. If you want to see a panoramic array of stars and constellations, go to the desert, far from any light (you will need to backpack). However, the drop in temperature at night may leave you shivering so that you can’t focus. Anyone with eyes to see, knows that we live in a morally and spiritually dark time. As an adolescent, I was inspired by these words from the Crosby, Stills, Nash & Young song, “Long Time Gone” (1970): “You know the darkest hour is always just before the dawn; And it appears to be a long time before the dawn…” And these words of St. Paul: “Do all things without grumbling or questioning, that you may be blameless and innocent, children of God without blemish in the midst of a crooked and twisted generation, among whom you shine as lights in the world…” (Philippians 2:14-15, ESV) Rejoice sisters and brothers! This is our time to shine! 3) People who want to hide what they are doing, run from light (like cockroaches I’m told), and seek the darkness. This is all of us at some time. “The light shines in the darkness, and the darkness has not overcome it.” (John 1:5, ESV) “And this is the judgement: the light has come into the world, and people loved the darkness rather than the light because their works were evil.” (John 3:19, ESV) This explains a lot about us, our cultures and our society. 5) Yeshua’s disciples, his Light Workers, if you will, are called to be lights & witnesses for others. Yeshua: “You are the light of the world. A city set on a hill cannot be hidden. Nor do people light a lamp and put it under a basket, but on a stand, and it gives light to all in the house. In the same way, let your light shine before others, so that they may see your good works and give glory to your Father who is in heaven.” (Matthew 5:14-16,ESV) Enough said. 6) The most joyful and free way to live is to walk in the light, to live in candor and openness before God and to live in candor and openness with our sisters and brothers in Jesus Christ. “This is his message we have heard from him and proclaim to you, that God is light, and in him is no darkness at all. If we say we have fellowship with him while we walk in darkness, we lie and do not practice truth. But if we walk in the light, as he is in the light, we have fellowship with one another, and the blood of Jesus his Son cleanses us from all sin.” (1 John 1:5-7, ESV) What would it mean to walk in freedom without guilt? Think about not having to keep your story straight. Imagine a world with complete trust between members of the Body of Christ. My dad called this living with “roof off and walls down.” Or alternatively, keeping short accounts with both God and others. This post was powered by the EP, “Peace, Love & Light” (2013) by The Choir; the CD, “Songs for Christmas” (2014) by Branches; and the EP, “Echoes Of Wonder” (2015) by Salt Of The Sound. Tags: Advent, CSN&Y, Hanukkah, I am the Light of the World, Jack Lewis the Bible Study Dog, light, Light of the World, walking in the light | Permalink.